Casual, tousled but ultra-sophisticated this trend-setting look is perfect for bringing your long hair right up-to-the-minute! The side parting adds asymmetry that creates a long sweep of hair draped seductively over one eye. The long layers create attractive volume at the sides and around the head and the broken, defined waves vary between loose curls and straighter sections, ending in lightly textured tips. Combined with dip-dyed high-lights and darkest brown low-lights, the movement and fabulous mix of textures is accentuated to perfection. The styling is tousled and full of challenging attitude, showing that the confident wearer doesn’t need girly curls to show her femininity! 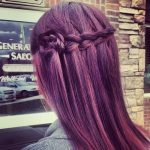 Do you love this hair color? Get more hair color inspirations here. 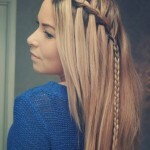 Under: Braided Hairstyle 20 Simple Easy but Beautiful Waterfall Hairstyles You Can Try!